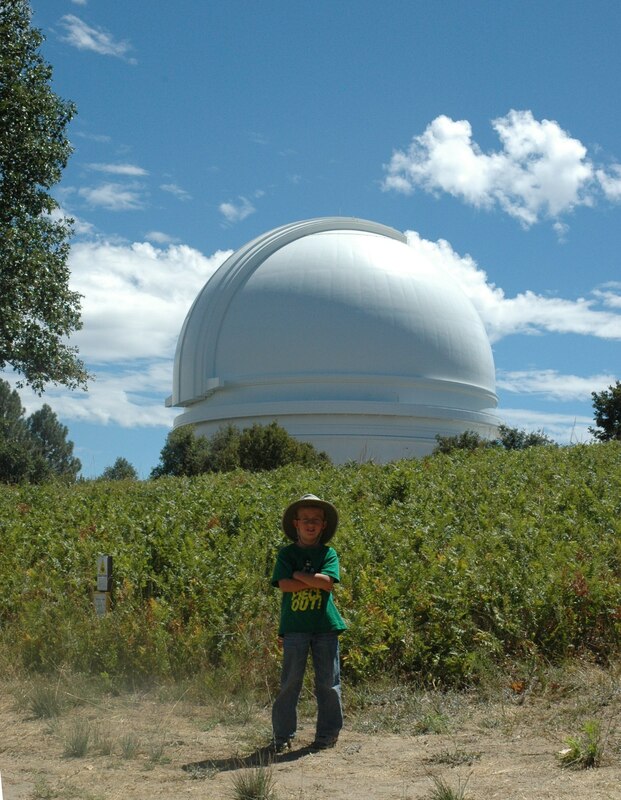 I have been fortunate to visit two of the great research observatories in California: Lick Observatory on Mount Hamilton, overlooking San Jose, which got me into all this in the first place; and Mount Wilson Observatory, where I’ve gotten to observe twice with the 60-inch telescope. For a long time I have been meaning to get to the third major research observatory in California: Palomar. The building of the 200-inch (5-meter) telescope during the Great Depression was one of the first scientific “megaprojects”, something akin to the Apollo program or the search for the Higgs boson, and it caught the public interest in much the same way. After serious war-related delays, the great machine was finally dedicated in 1948, had its official first light in 1949, and started regular research observations in 1950–a program that continues to this day. The 200-inch telescope was absolutely the world’s largest telescope from 1948 to 1976, and effectively the world’s largest telescope until the first Keck telescope came online in 1993. The 6-meter Soviet BTA-6, which was completed in 1976, was more of a publicity stunt than a functional instrument and has not lived up to its potential, although I hear it is being overhauled so maybe that will finally change. If you are remotely interested in the history of big telescopes in general and the history of the 200-inch in particular, I highly recommend The Perfect Machine, by Ronald Florence. If I started relating all the interesting anecdotes about the building of the telescope, we’d be here forever–it will be faster and more enjoyable to read the darn book. Anyway, yesterday I was staring down the barrel of a 3-day weekend with no definite plans. 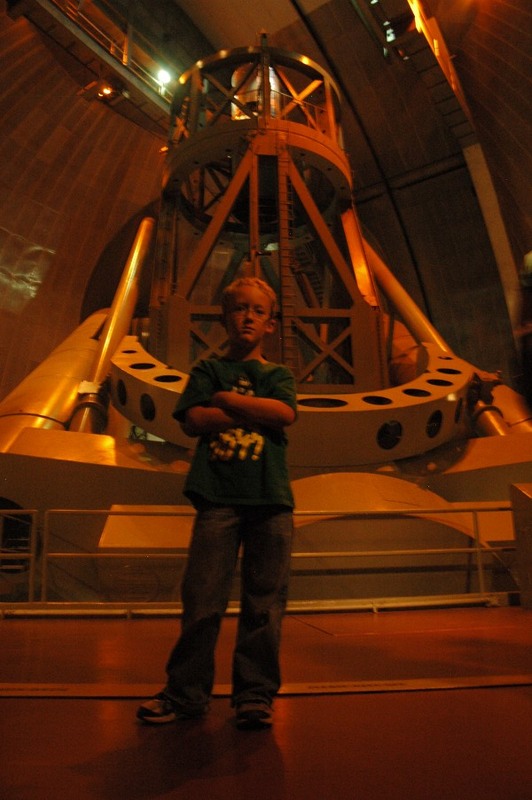 I decided that it was finally time to go see the “big eye” at Palomar Mountain. London and I didn’t get on the road until early afternoon, so we got down there too late to visit the observatory yesterday. 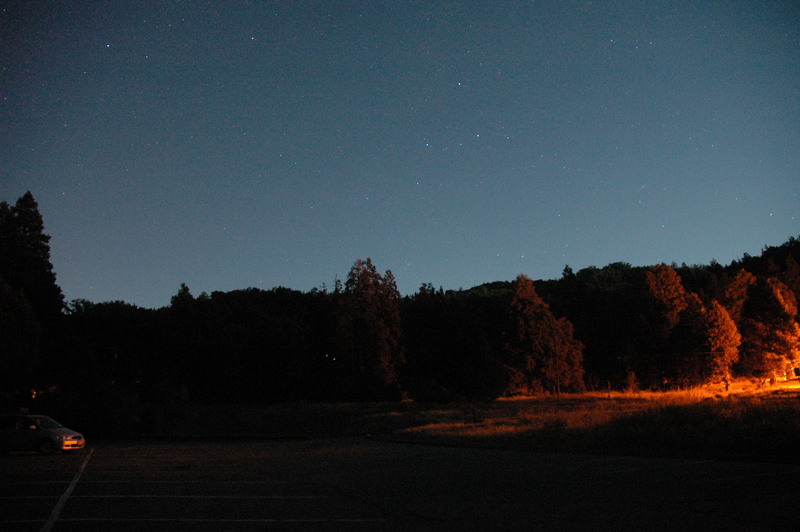 Instead, we went to nearby Palomar Mountain State Park for a phenomenal sunset and some early evening stargazing. I had along a new toy: Vicki loaned me her Nikon D70 DSLR. She’s had it for three or four years, I’ve just never used it. It’s been on my to-do list, though, and Kevin’s results on Mount Baldy a couple of weeks ago gave me just the kick that I needed. I have been waiting not-s0-patiently for the full moon to pass so that I could try my hand at photographing constellations. London in the meadow by Doane Pond, with the handle of the dipper hanging overhead. After sunset London and I went down to Doane Pond, which sits in a nice little bowl with mountains on all sides. We went on a night hike around the pond, which resulted in us accidentally scaring several bullfrogs and them scaring us right back–few things are more alarming than an unsuspected animal making sudden noisy movement right by your feet in the dark. I also stopped at various places around the pond to photograph the sky, the pond, or the sky reflected in the pond. I should preface all this by saying that I have no idea what I’m doing. This is my first time using a DSLR, I have no idea what about 95% of the controls do, and if you actually know photography you’d best put your beverage down now so you don’t spit it all over the keyboard. Nevertheless, I have read that one can get passable constellation photos with exposures of 30 seconds or less, and you are about to see my first round of results. I’ve been rereading Leslie Peltier’s Starlight Nights. I think of it, and Timothy Ferris’s Seeing in the Dark (the subject of this previous post), as “books about the why”. Loads of books will tell you how to stargaze, but very talk about the actual thoughts and emotions associated with the practice. 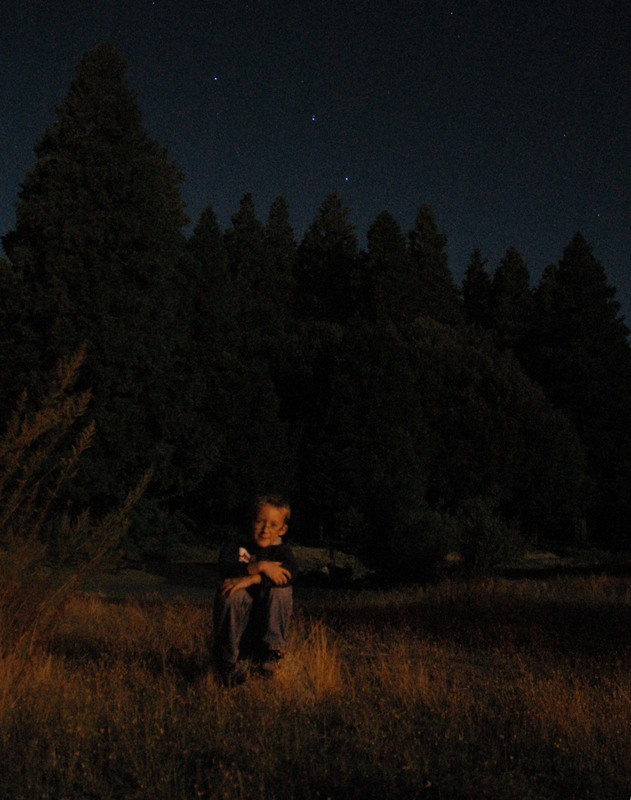 If you want to know why to stargaze, go read Starlight Nights and Seeing in the Dark. Just be warned–if you’re not a stargazer now, you may be one by the time you’re done (also, if you’re not, I don’t know what you’re doing here, but welcome!). Peltier writes with great warmth about his favorite stars, especially Vega, which was the first star he knew by name. I’d be hard pressed to name one favorite star, but I have a favorite constellation, and that is Cassiopeia. When I started getting into astronomy in the fall of 2007–almost five years ago, now–Cassiopeia was the first constellation I learned. All that autumn I turned my gaze northeast at dusk and found Cassiopeia first. She pointed me on westward to Cepheus and Draco and ultimately to Hercules and M13. To the south she led me to Pegasus, Aries, faint and frustrating Triangulum, and of course Andromeda and its magnificent galaxy. And following in Cassiopeia’s train as she climbed the eastern sky I found the Double Cluster and Perseus, the Pleiades, the Hyades, Auriga and its nice trio of Messier clusters, and the constellations of winter. Our romance has only deepened as I’ve gotten to know her better, for the velvety black folds of her dress are adorned with star clusters and nebulae almost beyond counting. Naturally, I pointed the camera in her direction first. 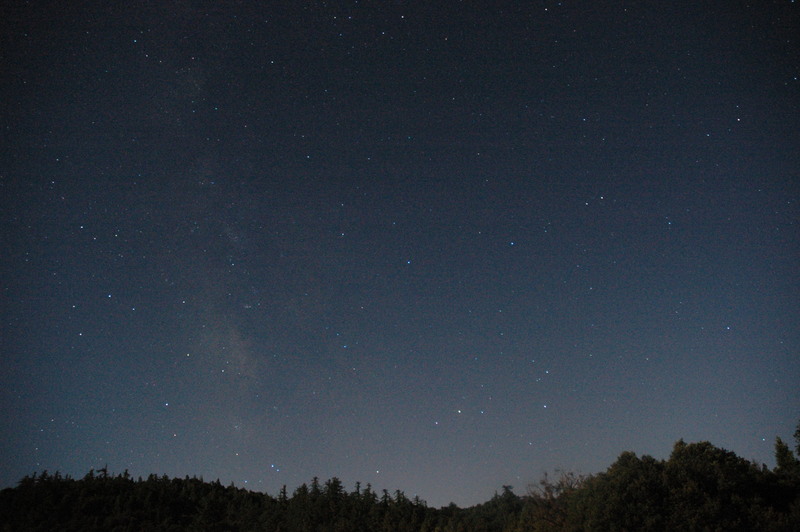 My first constellation photo–click through for the full-size, unlabeled version. This is not a triumph of astrophotography. It’s grainy, it’s too bright, and the composition is not stellar (to, er, coin a phrase). But Cassiopeia is there, and I even see the Double Cluster just clearing the trees. 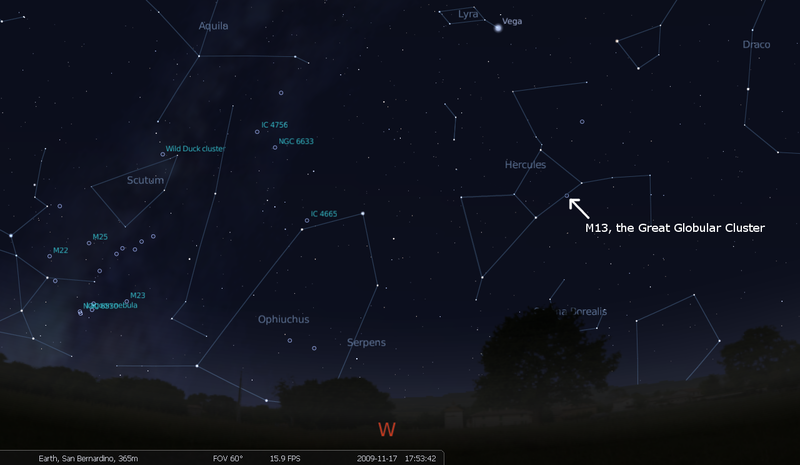 After paying my respects to Cassiopeia, I turned south, to Sagittarius and the summer Milky Way. Here’s the best of the lot, without labels. And the same thing with constellations and deep sky objects labeled. Not every bright deep sky object is labeled, only those where I can see at least a smudge or a couple of bright pixels. Still, there are at least 19 DSOs visible in what was probably a 20- or 25-second exposure. I am really looking forward to trying this under darker skies. It never got truly dark at Doane Pond, because the nearly-full waning gibbous moon rose well before the end of astronomical twilight. I think that without the moon it would have gotten very dark–maybe not stupid-dark like the remote places in the Mojave, but darker than Mount Baldy. 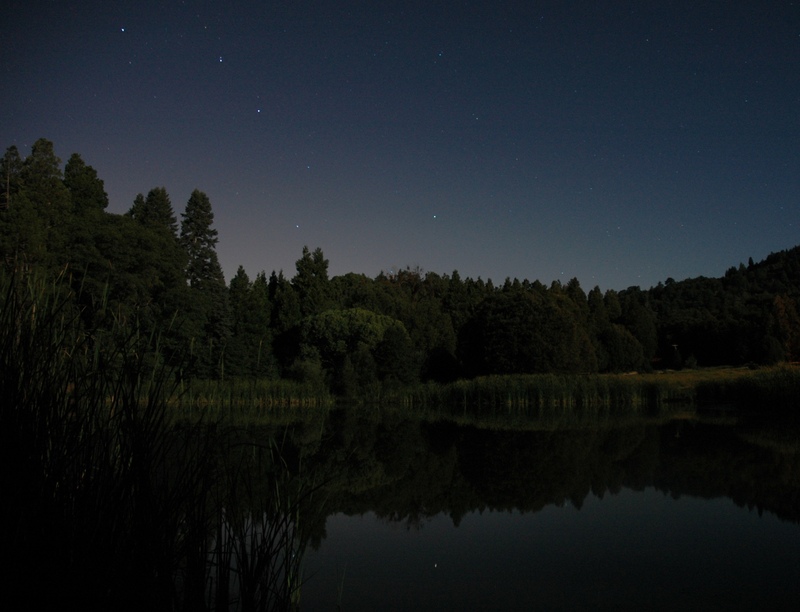 One more: the Big Dipper over Doane Pond, with a couple of its stars reflected in the pond. The pond was about as still as it could be, given the number of big splashes caused by alarmed bullfrogs (and, therefore, ultimately caused by me!). Two things you shouldn’t mess with. To truly grok the immensitude of the telescope, check out the normal-size, full-width ladder going up one beam on the near side. The fork arms on either side have stairways inside for servicing the drive motors. Today we went up to the top of the mountain and toured the observatory. Oddly enough, I don’t have a ton to say about this, beyond the obvious things. Which are (1) it’s awesome, and (2) if you live within striking distance, you should definitely go. Get there in time to get tickets for the guided tour–it’s waaaaay better than the self-guided tour, the docents are friendly and know a ton about the telescope and its history, and you’ll get to go up onto the catwalk inside the dome and get a much better view of the scope than you can from the little glassed-in visitor area on the dome floor. You really need to walk under and around the scope to get a sense of how immense it is, and you can’t do that except on the guided tour. I have been around some big scopes, including the 3-meter Shane reflector at the Lick Observatory, and the 200-inch makes all the others I’ve seen look like toys. Even knowing intellectually how big it is, I still walked in and thought, “OMG that’s big.” It’s inhumanly big. 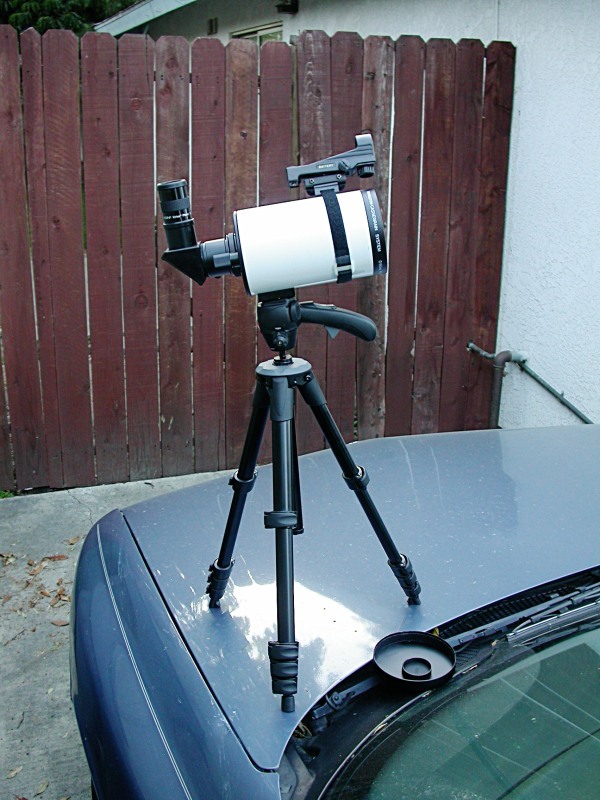 The only downside to the whole trip is that as I was packing us up to leave, I momentarily set my observing notebook on top of the car–and then forgot to get it before we drove off. That’s a bummer. I have almost all of the observations backed up in my digital observing log (a huge Excel file), but the notebook had lots of sketches and there were probably a few object descriptions that I had not logged digitally. There’s a slim chance it will turn up, but I’m not holding my breath. 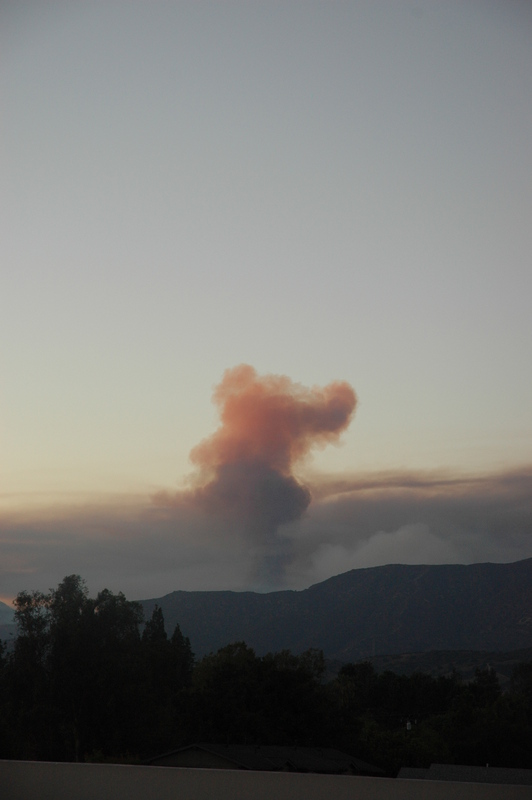 While I watched, I saw and heard several helicopters making runs to dump either water or fire-retardant foam. 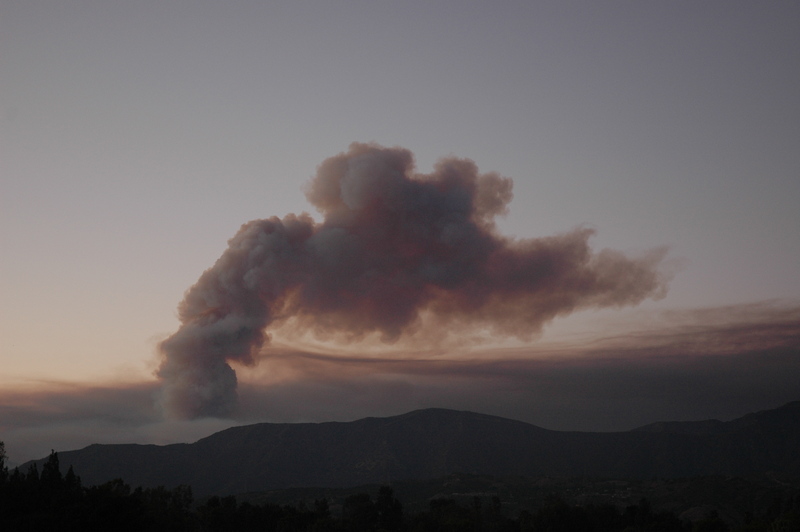 At that time, the fire had spread to more than 1000 acres and percent containment was zero. I’ve been up in the mountains lately and they’re bone dry, so this could be a bad one. My prayers are with the firefighters, and the people whose homes lie in the path of the fire. Instructions: Go outside after dark, face northeast, and look for the sideways W. If you’re not sure which W is which, take a free sky map. 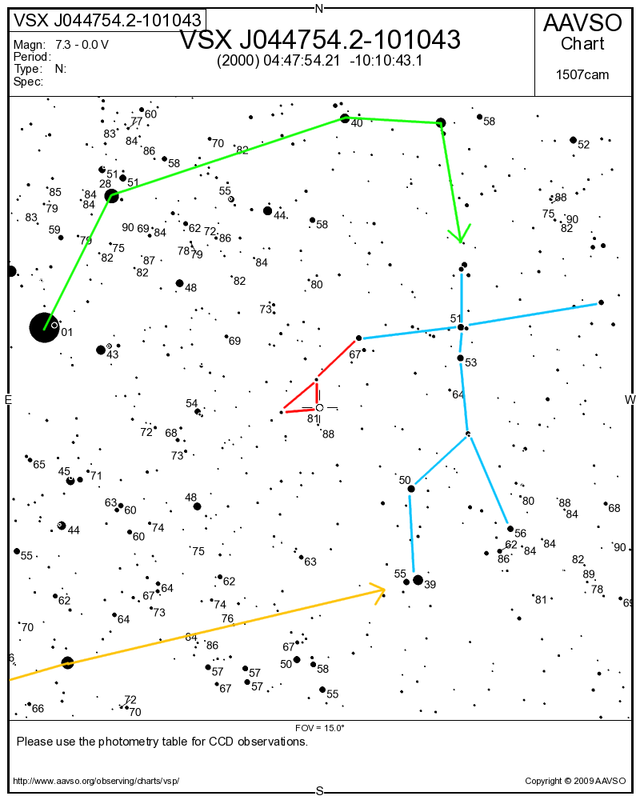 The W is Cassiopeia, which lies right smack in the middle of the winter Milky Way. 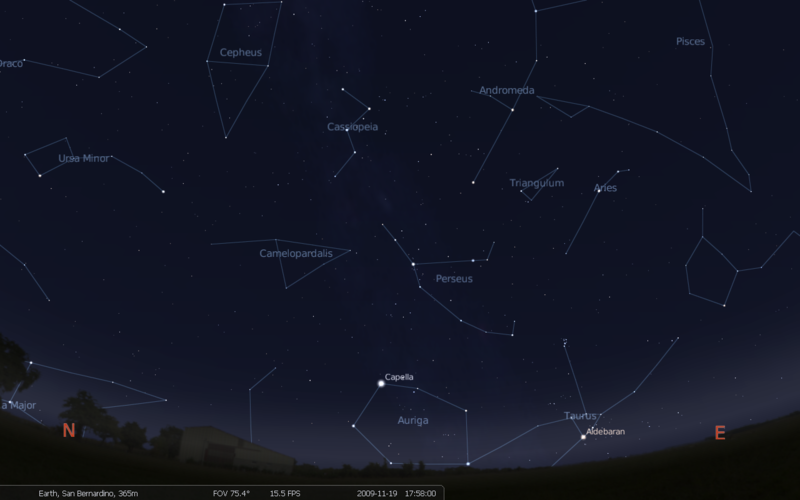 Cassiopeia is a deep sky wonderland in binoculars and telescopes. 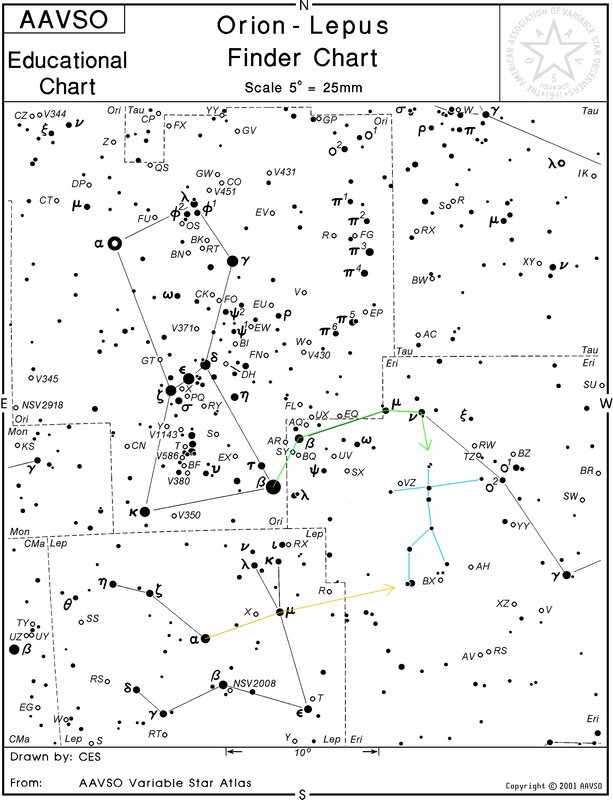 There are more star clusters than you can shake a stick at–a decent portable sky atlas will show a dozen or more. Even without an atlas, it’s an awesome area to scan around in with optics of any size. I have a confession, though. Almost every time I go out to observe in the winter, I give Cassiopeia a quick once-over and then leave. Why? Because there’s an even better pair of clusters lurking over the border of the neighboring constellation, Perseus, and Cassiopeia is such a good pointer that you might think it was put there for that purpose. Follow the inner leg of the shallow half of the W about 2/3 of the way to the next bright star, and you’ll find the Double Cluster, NGC 869 and 884. 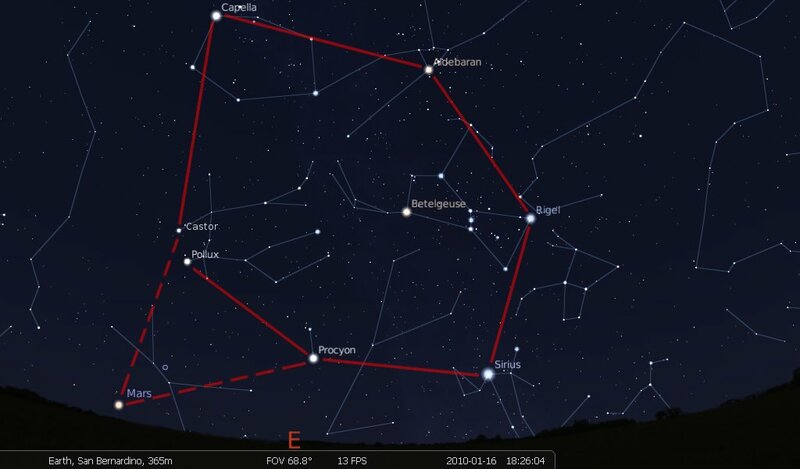 Keep in mind the effect of sky rotation–by 8:30 PM, Cassiopeia is an M centered over the North Star, and by midnight it’s a sigma to the northwest. Adjust your expectations accordingly. The Double Cluster is one of the finest objects in the night sky, and almost always makes it onto lists with names like “Top 10 Telescopic Targets”. I’m not going to show you any pictures of the clusters themselves, because this is one place where pictures simply don’t do justice. You’ll have to get out under the night sky and see for yourself. Once you’ve had your mind blown by the Double Cluster, keep on cruising in the same direction and follow the chain of bright stars to Mirphak, or Alpha Persei, the brightest star in the constellation Perseus. Mirphak is surrounded by a broad field of stars called the Alpha Persei association; it is too big to fit in the field of view of most telescopes (except possibly fast focal ratio, widefield scopes like the Astroscan and StarBlast 4.5 ), but is instead one of the best binocular targets in the entire sky. Have a look and let me know what you think. Introduction: This is a weird time of year. 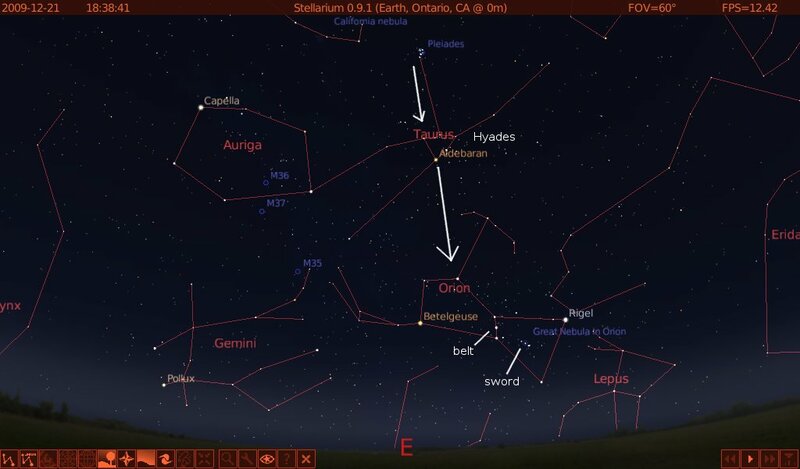 The classic “summer” constellations are still visible right after sunset, and by bedtime the winter constellations–especially Orion–are already coming over the eastern horizon. Of course the globe of the sky is (relatively) unchanging and you can see an angular span of the same width on any night of the year. Nothing is actually accelerated right now. It only feels odd because of the associations these stars have for me. Say “Hercules” and I think warm summer evenings and junebugs. The Pleiades, on the other hand, conjure up memories of gloves, stocking hats, and the crystaline quality of the air on a cold winter’s night. And yet you can see these things on opposite sides of the sky at the same time! Owing to my long hiatus this fall, I let a few of the great summer objects almost get away from me. 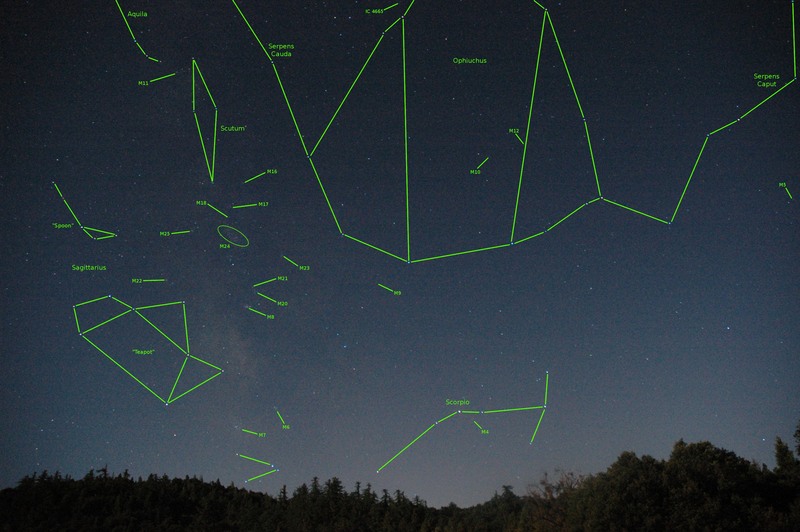 Meanwhile, a host of excellent autumn targets are high overhead even at dusk. So we’ve got no time to waste. 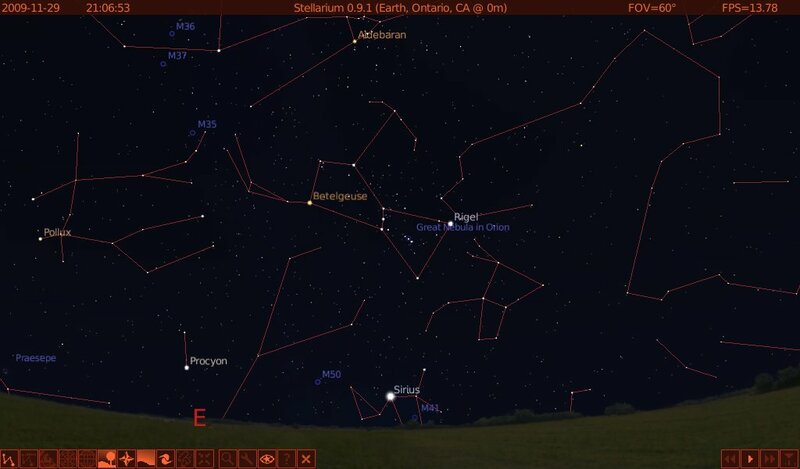 Instructions: Find Vega in the western sky right after sunset, and then look below it to find the back-to-back trapezoids that make up the body of Hercules. I strongly recommend taking a planisphere or sky map, such as one of the free seasonal ones here or here. If you’re like me, you can look at the map indoors, fix the points and relationships in your mind’s eye, go outside and instantly get lost. 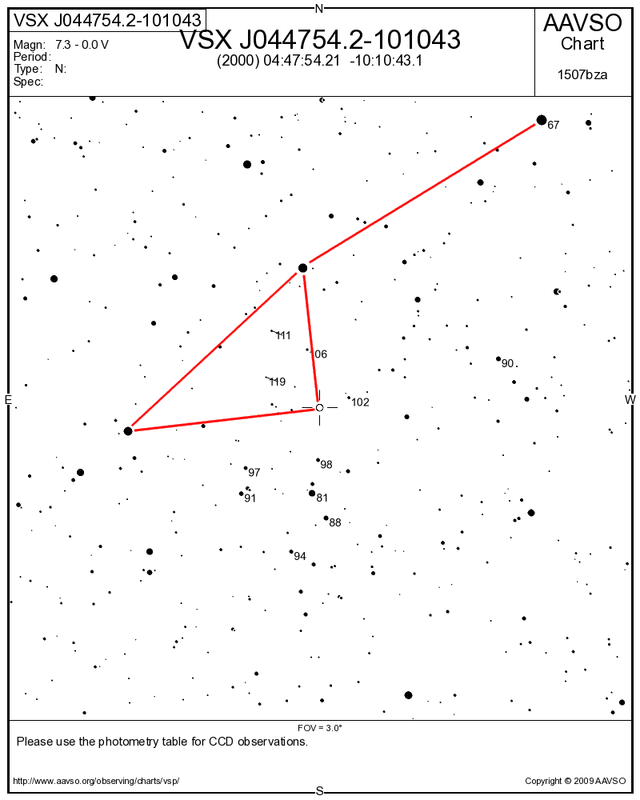 Hercules doesn’t have any first magnitude stars to help you orient, and there are far too many medium-brightness stars, so the number of possible trapezoids you can construct is large. This is where the directions I can give break down; there is just no substitute for having the map in your hand, especially since the free ones are so good these days. 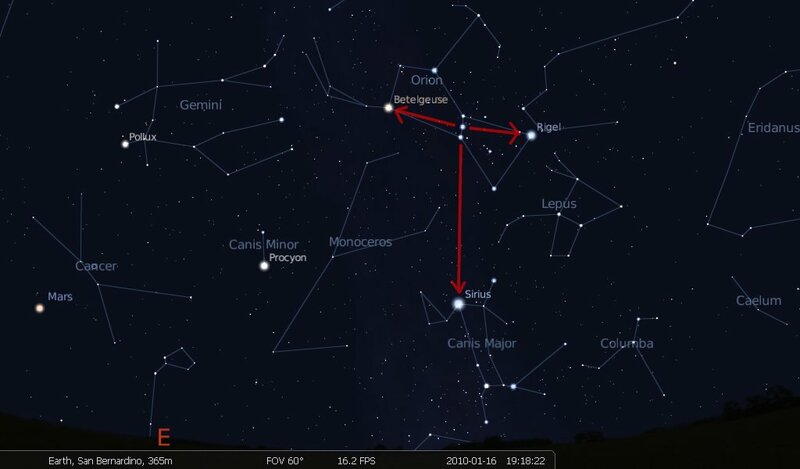 See how many of the stars west of Vega you can see with the naked eye, and then draw a trail that will guide you from Vega down to where you need to go. The path you find will be the one that makes the most sense to you. You’ll know for sure when you’ve got the right trapezoids, because 2/3 of the way along the western edge of the northern trapezoid is a fuzzy ball. 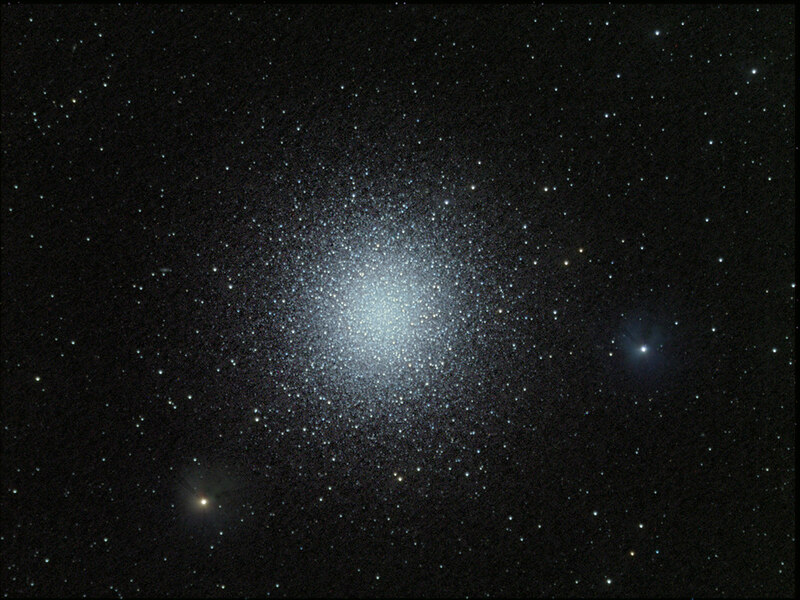 This is M13, the Great Globular Cluster in Hercules. 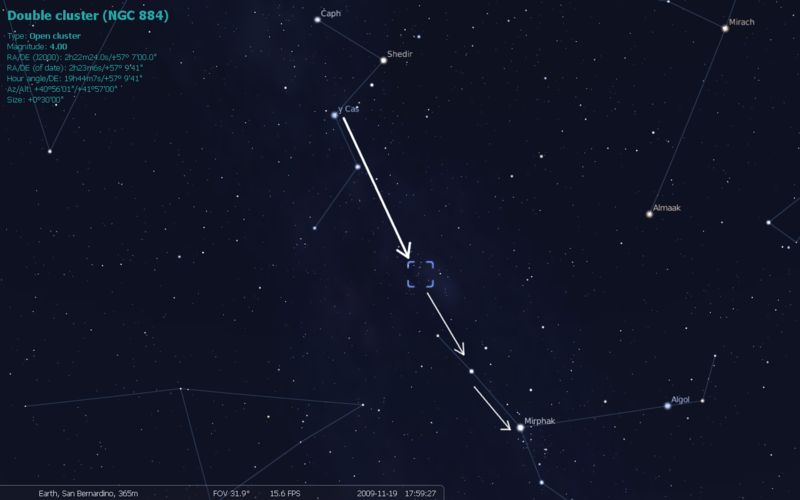 If you are under super dark skies you might just make it out with the naked eye as a dim and blurry star. Under all but the worst city lights, you can sweep between the two boundary stars and pick it up in binoculars. In 10x50s it is an attractive ball of fuzz, and in 15x70s it is a slightly larger, brighter, and more appealing ball of fuzz. In a small telescope some of M13’s 100,000 stars start to resolve, like a spill of very fine sugar on black velvet. 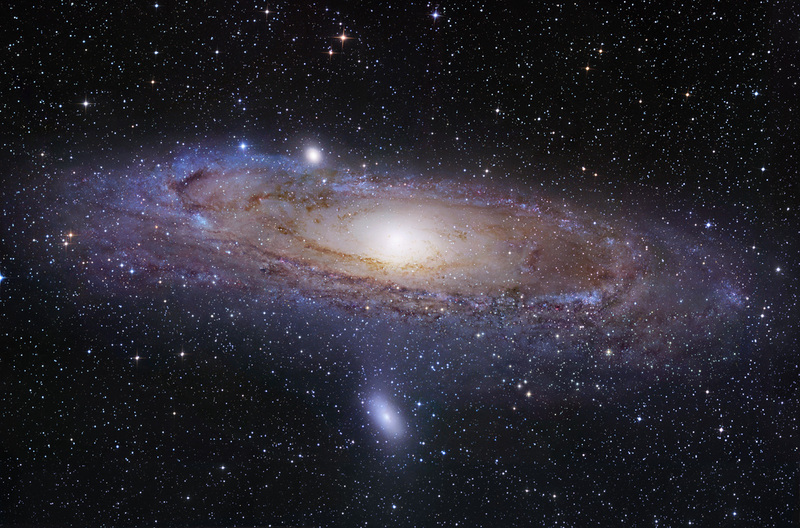 In a big telescope, like my friend’s 16-incher, it is almost overwhelming; the eyepiece is so full of stars that it gets to be too much for the eye–and the mind–to take in. I found myself repeatedly looking away to give myself a break. That’s good stargazing. 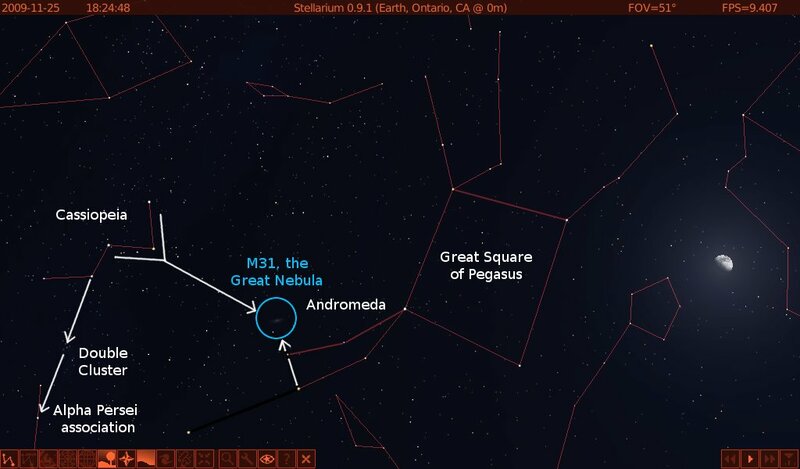 Like M22 in Sagittarius and all other known globular clusters, M13 is old, and I mean old even for astronomy, where a five-billion-year-old star like the sun is something of a youngster. Even if all you have to see it with is binoculars, there is something special about tickling your retinas with the light of 100,000 twelve-billion-year-old suns. You are currently browsing the archives for the Constellation category.